Failure is part of predictions. Certainty demands comprehensive intelligence, which is by definition absent in the business of forecasting. But in prediction, the question isn’t whether you fail: that’s expected. The metric by which success is determined is rather how often. That is what separates the genius from the idiot. Let us score last year’s predictions, then, so that you may know whether to pay attention to the 2011 iteration. The December partnership between Eucalyptus and Red Hat highlights the issues with API proliferation. Granted, for Eucalyptus, the deal was likely driven more by pragmatism than customer pull with respect to Deltacloud. But the fact that an API superset was discussed on equal footing with the partnership itself speaks to the central role APIs are taking in cloud deployments. Google Trends validates the assertion that 2010 saw increased activity around cloud APIs. This activity – which led, in part, to the rebranding of Sonoa – represents interest, yes, but also the challenge. As the software industry reorients around the cloud, APIs become their primary customer interface. 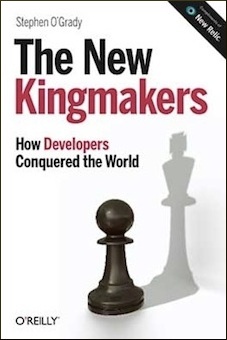 Which, given the proliferation of vendors in the space, is problematic today and likely to become more so: an API per provider is an approach that will not scale. I feel safe counting this one as a hit. Scoring this prediction is a challenge. The cited projects – Google Wave and Mozilla Raindrop – have failed to deliver, with the former officially deprecated and the latter effectively so. Nevertheless, collaboration did fundamentally change in 2010. Priority Inbox introduced algorithmic email ranking to the masses. Tungle continued to facilitate scheduling. Rapportive injected social networking into Gmail. Dropbox launched synchronized file sharing capabilities for teams. New Twitter fostered conversations on the service. And Facebook has promised to reinvent communication with its forthcoming Facebook Messages offering. I’ll call this a push. To the best of my knowledge, we have yet to see data recognized as a balance sheet worthy asset. That’s a miss. And yet with Goldman valuing Facebook as a $50B entity on the basis of a reported $2B in revenue, it’s clear that the value of data is well understood, if implicitly. The venture community appears to agree, funding data marketplace startup Infochimps to the tune of $1.2M. I’ll call this one a miss, if only because the prediction, aggressively stated, was unfulfilled. I stand behind the conviction, however, and I think the market bears it out. Consider that RedMonk, a four person analyst shop, has the technical wherewithal to attack datasets ranging from gigabytes to terabytes in size. Unless you’re making institutional money, budgets historically have not permitted this. The tools of Big Data have never been more accessible than they are today. Hadoop, in paricular, has made remarkable strides over the past year, with improvements to core, projects such as Hive evolving and others like Oozie emerging. The center of gravity around the infrastructure is remarkable, with a few properties even bending it towards traditional back end web roles, ill suited as it is for that generally. Nor is Hadoop the only example of the ready availability of tools. Non-relational stores continue to evolve at an impressive rate, with hardware access not far behind. This one is a hit, as far as I’m concerned. If anything, I didn’t predict this aggressively enough. There is observable fragmentation in virtually every area of infrastructure technology: operating system, database, programming language, development framework, mobile platform, cloud platform, cloud API [coverage]. Even hardware is less straightforward than it once was, with ARM a driver in mobile with larger potential. All of this has happened before, of course: the Cambrian explosion of diversity we’re currently witnessing is not unprecedented. It is, however, potentially further reaching as the boundaries between consumer and enterprise break down, and distinctions between on premise and network hardware blur. The launch of Tableau Public in February [coverage] and its subsequent success is enough to validate this prediction by itself. The introduction, a month later, of the Google Public Data Explorer is gravy: analytics are fast becoming ubiquitous. 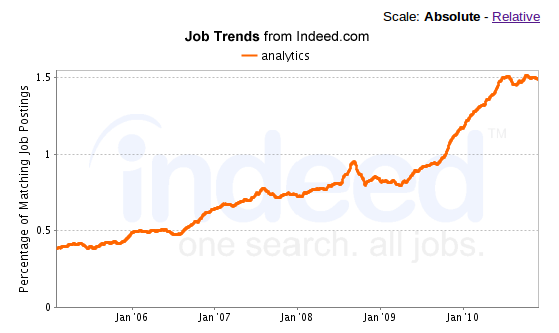 It’s hard to miss infographics in the New York Times or the Economist, and as the data from Indeed.com indicates, hiring in the analytics space spiked in the last twelve months. When browser makers feel compelled to launch marketplaces effectively rebranding websites as applications – as Google did in May – it’s safe to conclude that marketplaces are table stakes. We’re even seeing marketplace proliferation within a single ecosystem, in Android. Vendors are at last perceiving the demand for marketplace features – centralized discovery, standardized payment, etc, but the real driver is the realizable revenue they represent, model depending. In other words, if you have platform ambitions, you’d better be bringing a marketplace. So this is a hit. Even if we do not include Hadoop, which has clearly crossed the chasm towards mainstream adoption, it’s clear that NoSQL is finding fertile ground in mainstream enterprises. Most NoSQL vendors and technologists we work with have done substantial work over the past year for name brands. From Riak deployments at Comcast to MongoDB instances at the New York Times, it’s safe to say that NoSQL is making a bid for mainstream markets. I also made five brief, FOSS specific predictions. Prediction: Usage of dual licensing will continue to decline, in part because of the Oracle and EU dispute over MySQL. Comments: Dual licensing, which is distinct from what is commonly called dual core, is in evident decline. With the exception of long time practitioners such as MySQL, dual licensing is becoming increasingly rare. I’ll call this a hit. Prediction: FOSS advocates will increasingly turn their attention from licensing to the related mechanisms of copyright and trademark. Comments: Copyright and trademark have both taken center stage over the past year; the former most obviously with respect to the acquisition of MySQL via the Sun transaction, the latter most recently with Oracle’s mishandling of the Hudson assets. This is a hit. Comments: Comparing the Black Duck license adoption figures I have at hand (meaning no January 2010 numbers), since August 2009 I have the GPLv2 down 4.02% (though v3 is up 1.34%), while Apache is up .65% and MIT 3.9%. This reflects our experience and our expectations, with permissive licenses trending up and reciprocal licenses trending down. Hit. Prediction: The value of project code will be eclipsed, in a few cases, by the data the project generates. Comments: This is more difficult to assess. Much of Facebook’s software infrastructure, as an example, is made available via open source, indicating that for that organization, software is non-differentiating. The selection of Hbase over Cassandra as the foundation for Messages serves as further validation of the substitutability of the underlying infrastructure. But neither example yields hard valuations of the underlying code, making an assessment of this prediction difficult. This one’s a push. Comments: At the infrastructure-as-a-service level, Cloud.com, Eucalyptus and OpenStack are the primary alternatives at this point to roll-your-own cloud offerings. All make at least a portion of their source available. At the platform level, open source frameworks such as Django (Djangy, GAE), Rails (Heroku, Engine Yard), and Spring (VMware) are emerging as developer preferred alternatives to vendor specific platform implementations. This is a hit, in other words. Scoring the 2010 predictions, then, we get six of nine correct for the main category against two misses and one push. Amongst the FOSS specific predictions, four of five were hits with one push. A sixty-seven percent success rate in non-FOSS predictions may seem unimpressive, but anything better than fifty percent can produce market value so I am comfortable with the results. If you enjoyed last year’s predictions, then, please stay tuned for the 2011 version. Disclosure: Apigee, Basho (Riak), Black Duck, Eucalyptus, and Red Hat are RedMonk customers. 10gen (MongoDB), Facebook, Oracle and Google are not. Regarding the rise of permissive licences. What happens if you include AGPL with GPL on the less permissive side? Anecdotally I’ve seen a rise in the use of AGPL and it’s possible that it is replacing GPL in some places. @Neil Bartlett: not much, in all likelihood, because the AGPL wasn’t in the Top 10 most popular licenses, meaning that it’s < 1% in usage in the surveyed projects and thus not likely to swing the conclusions one way or another.